If 30 is the new 20, I think I'm 45. For the past three years, my co-teacher and I have been our school’s representatives at our district’s annual Chili Cook-off. The event raises money for an organization that provides grants to local educators as well as scholarships to our graduating seniors. Besides the chili competition (my part, I’m the chef), the event is also a contest for who can create the most rawk-your-face-off booth (my co-teacher’s domain), and we have won the booth contest for the last 2 years. Last year we won with the booth theme The Fellowship of the Chili featuring a mural of Mount Doom created by one of our students. This year, we won with the theme Star Wars: The Chilogy (did I mention we’re theatre teachers, aka DORKS), and we went all out. We created a scale, chili-shaped Death Star and a life-sized R2D2, had teachers dressed as Princess Leia and Han Solo (I was the Emperor), and our tent was a giant AT-AT. The crown jewel of our display was a huge X-Wing Fighter poised as if rocketing straight out of our booth. It was awesome. Now Bubba is already a huge Star Wars geek, so he was unbelievably excited about our project. And somewhere along the way he decided that he was going to get R2D2 when the event was over. Unfortunately, R2 was the only part of the display that was small enough and sturdy enough to be displayed in our classroom, so our students claimed him, much to Bubba’s dismay. We finally calmed him down with the promise that he could choose something else from the booth for him to keep in his room. So what did he choose? The giant X-Wing of course! And he insisted it was to be hung from his ceiling, as well! Normally, I would have put the kibosh on a notion as insane as this, but I didn’t want to go back on my word and also felt guilty because I had my final dress rehearsal for my fall show on the night of his birthday the following week, so I caved and brought home the X-Wing. The thing was HUGE, not to mention heavy, and also HUGE. Plus, it was built by theatre folk, meaning it looked good at a distance in the precise position that it was designed for, but up close it looked pretty crappy and unfinished. It was also damaged when we took down our booth (we weren’t planning to keep it) and then sustained further injury during transport back to the school. So it sat, in pieces, in Bubba’s room for 3 months because it was too heavy to hang, too big to allow for any movement in his room for anyone older than 5, and was unfinished on the bottom…the part that most people would see. And every other week or so he would ask “When are you going to put up my X-Wing, Daddy?” to which I would have to respond “I don’t know if I’ll be able to, bud” which inevitably led to tears. Finally, as we were putting his Christmas presents away and trying to reorganize his room to accommodate, I broached the subject of tossing the X-Monstrocity. 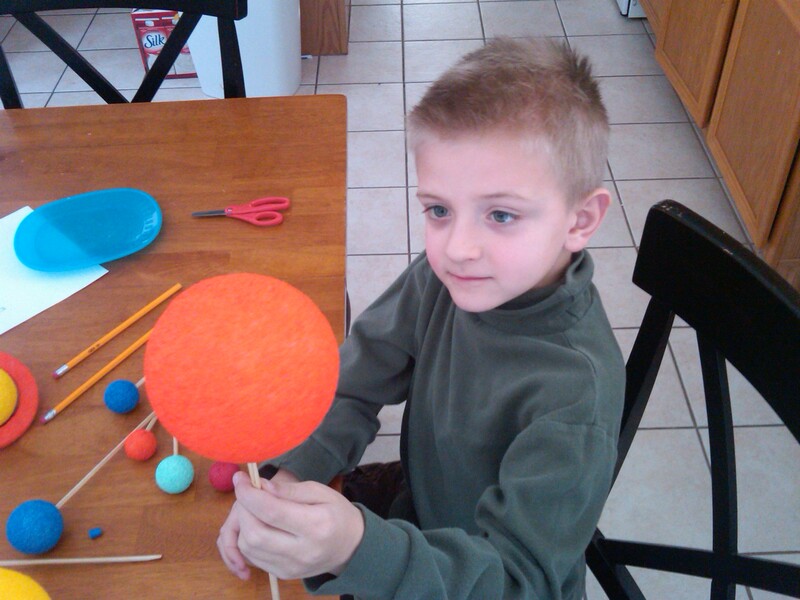 Now I could have created a solar system to meet his specifications, but I didn’t really have the budget for that, so instead to end our boys outing last Saturday, I took him to a hobby store and let him pick out a much smaller, pre-packaged and painted model made out of styrofoam balls and dowel rods. For the kit and the styrofoam glue needed to complete the project, I spent 15 bucks. He was elated, and we spent about an hour of QT together this afternoon assembling it. Success! What’s the lesson to be learned from all of this? The force is strong with Bubba, and he knows how to use it. But Luke still has his fair share of force as well.